Earlier this month Television Obscurities celebrated its 12th birthday (on June 11th, to be exact). That’s not a milestone anniversary so I didn’t mark the occasion but you can read a two-part history of the website written in 2013 to commemorate its 10th anniversary here and here. 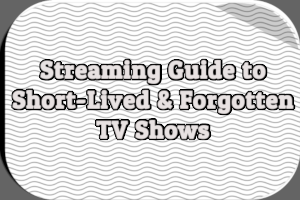 In recognition of one dozen years online, I’ve decided to start examining my personal favorite television obscurities. Once a month I’ll be writing about my 12 favorite obscurities from each decade starting with the 1940s this month and ending with the 2000s in December. Many of these shows I’ve written about over the past 12 years but not all of them. The oldest of my favorite obscurities, Thrills and Chills will turn 74 later this year. Doug Allan hosted the series, which featured films of expeditions and adventures plus interviews with the explorers and adventurers who shot them. It was one of the longest-running early TV shows, on the air from August 1941 through June 1946. It started on WNBT in New York City, which was the first commercial station in the country, and later moved to DuMont’s experimental station W2XWV (which became commercial station WABD in 1944). There is no evidence to suggest it was sponsored at any point on either station. According to Allan it was a very popular show. I’m sure by today’s standards it would seem boring but apparently in the 1940s viewers in New York City were thrilled to be able to watch films from exotic locales and get to hear from the brave men and women who traveled the world seeking adventure. My spotlight on Thrills and Chills can be found here. I’m not sure exactly when The Face of the War premiered. I believe it debuted in September 1941, a few months before the United States entered World War II. It originally aired on WNBT in New York City but likely wasn’t sponsored. Details on the program are scarce. Host Sam Cuff stood in front of a map with a pointer and discussed the latest news on the war, showing viewers where battles and offenses were taking place. Cuff was also part of the station’s coverage of the attack on Pearl Harbor in December 1941. The Face of the War remained on WNBT through May 1942. At some point, likely around this time, Cuff left WNBT to became general manager of DuMont’s W2XWV and The Face of the War went with him. It was initially seen on Sundays but in November 1943 began airing on Wednesdays and gained a sponsor. Pat Murray introduced the program and hawked Lever products like Spry, Rinso, and Lifebuoy Soap. The Face of the War ended sometime in 1945, likely after V-E Day in May or V-J Day in September. Although no footage is known to exist, the Library of Congress has audio recordings of more than 30 episodes of Hour Glass and Life published a set of seven photographs of a TV screen showing the first episode. So quite a bit of material survives for this early network offering. It is considered the first regularly scheduled network variety series. Standard Brands sponsored the hour-long show, which was hosted by Eddie Mayehoff and Helen Parrish. It aired on NBC’s early Eastern network consisting of WNBT, WRGB (Schenectady, NY), and WPTZ (Philadelphia, PA). Widely regarded as the first network soap opera, Faraway Hill ran for just 12 weeks on DuMont’s limited “network” between flagship New York City station WABD and experimental station W3XWT (later licensed commercially as WTTG) in Washington, D.C. Earlier soap operas on television were limited to individual stations. In 1944, when WABD was known as W2XWV and was still experimental, the station aired a soap opera called Theatre House. In 1938 (!) Don Lee’s experimental station W6XAO in Los Angeles aired a soap opera called Vine Street. While I’m not a soap opera fan by any means, I’d be very interested to see just how soap-y Faraway Hill was. According to The Complete Directory to Prime Time Network and Cable TV Shows, it featured recaps, voice-over narration, and the occasional film sequence. Footage from this bizarre mix of music, dancing, sports, and quiz show survives at the Library of Congress as part of the Hubert Chain Collection of early television excerpts. One day I hope to be able to see it. U.S. Rubber sponsored Campus Hoopla, which was set at a college campus soda shop filled with cheerleaders and other students. Episodes of the series reportedly featured the latest football, basketball, and baseball scores as well as game films. Bob Stanton, an NBC sports announcer, was on hand to narrate the films and participate in sports quizzes. There was also time for the students to jitterbug and sing. Eva Marie Saint was one of the cheerleaders, appearing in commercials for Keds sneakers. This 15-minute Sunday night variety show was part of a Bristol-Myers experiment with television and television commercials. 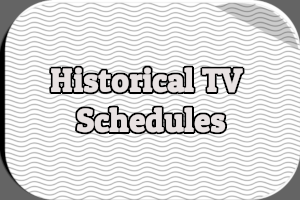 It wasn’t the first TV show to be sponsored by the company (Geographically Speaking, a travelogue with Mrs. Carveth Wells aired on WNBT, holds that distinction). On alternating weeks, the program featured commercials for Ipana and Mini-Rubt. Tele-Varieties debuted as a local series on WNBT on December 8th, 1946 and became an NBC network program a month later, relayed to WPTZ and WRGB. Initially, each episode featured three acts. The January 26th episode, for example, involved an Ed Gardner comedy routine, ballet dancer Joan Barry, and songs from the Four Vagabonds. 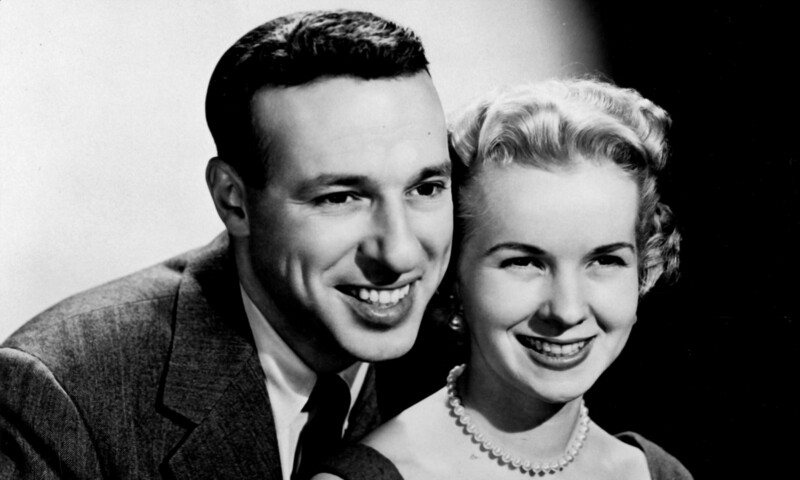 Tex McCrary and Jinx Falkenberg were also featured on the series, adapting their radio talk show for television. Bristol-Myers liked what they saw and replaced Tele-Varieties with At Home with Tex and Jinx in May. What intrigues me the most is just how experimental it may have been, particularly the commercials, which apparently were both filmed and live. Network television’s first sitcom, Mary Kay and Johnny ran on three different networks as both a weekly and weekday series, sometimes 15 minutes long and other times twenty minutes or a half-hour. Only one episode from June 1949 is known to exist and it just happens to be the first 15-minute weekday episode. This is another in a series of episodes based on the actual married life of television’s favorite young, married couple. Mary Kay and Johnny is famous for showing the title couple in bed together rather than in separate beds but unfortunately this episode doesn’t depict them in bed. I’ve long held out hope that somewhere in a dusty closet or attic there are boxes filled with kinescopes just waiting to be discovered. I’m sure if I ever get the chance to see an episode of this short-lived discussion series I’ll be disappointed. I find the concept interesting and the idea that ABC was willing to air a half-hour panel discussion featuring teenagers reviewing and critiquing books intriguing. Mary C. Scoggin served as host/moderator. 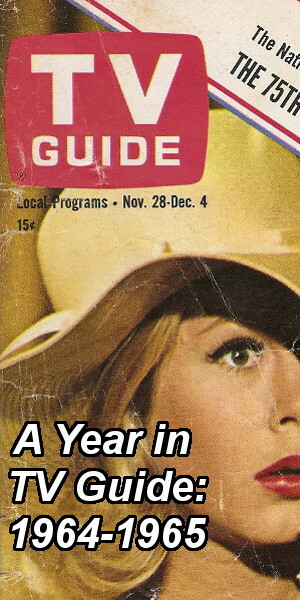 Teen-age Book Club was on the air for just 12 weeks. Guests, mostly authors, included Betty Betz, Harry Haenigsen, Garety Garreau, Ed Wallace, Louis Untermeyer, John Campbell, and Carl Glick. Kyle MacDonnell hosted this musical-variety show. It was her second network show and the first to be sponsored (by Bates Fabrics). I’ve been researching Kyle on-and-off for the better part of a decade all because of the title of this show. I seem to recall coming across a reference to it somewhere in book or magazine and decided to learn more about it. There wasn’t much to learn. I would love to see an episode of Girl About Town. The concept of the show was that Kyle was literally running around New York City meeting people and performing songs. Johnny Downs portrayed her “press agent” responsible for finding her gigs. The show also featured the Norman Paris Trio. My article about Kyle MacDonnell, with more information on Girl About Town, can be found here. Six episodes of this long-running ABC series were released on DVD in October 2008 by Alpha Video but there’s no way of knowing whether any of them are from 1949. I can’t say I’ve actually watched all six. By any standard Super Circus seems incredibly corny, with tame acts and incessant integrated commercials, but you certainly can’t find much fault with the show’s production values, which were impressive for the time, or Mary Hartline’s incredible enthusiasm. Here’s an unusual show: it aired six nights a week initially with each episode lasting for just five minutes. The episodes depicted a phone conversation between Ruthie and a man she was hoping would fall in love with her, occasionally utilizing a split screen so both could be shown on screen. Seeing just one episode would probably be enough to get a feel for the show. It was sponsored, so those five minutes also had to fit in a pair of commercials and probably opening and closing credits. That doesn’t leave a lot of time for content. Later episodes also featured guest stars. My spotlight about Ruthie on the Telephone can be found here. 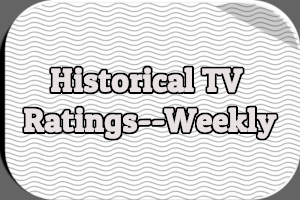 Hit the comments with your thoughts on these shows and any favorite TV obscurities you may have from the 1940s. Check back next month for my 12 favorite obscurities from the 1950s. Do you have any information on the books discussed on the Teen-age Book Panel? Just books by those authors? Harry Haenigsen created and drew a comic strip called Penny that ran from 1943 to 1970. I imagine that is what was discussed. Is Super Circus truly an obscurity? If you limit it to 1949, OK. But the show lasted for years, even with it being on ABC. It was one of Mike Wallace’s first TV gigs. Mary Hartline was a national sensation. It was said that more grown men watched, just to ogle her, than did children. By the way, last I knew, Mary Hartline is still alive, and many people still remember her. There’s certainly an argument to be made that any show that lasted for six or seven years can’t really be obscure. However, despite its longevity, it’s not really all that well known today. Yes, it was a very popular show at the time, but as far as I know it was never syndicated, so the only people who remember it are those who grew up watching it. I’ve grappled with the definition of a television obscurity for years. I think one of the most interesting and mysterious things about television is how a popular, long-running show like Super Circus can become somewhat obscure. There are hundreds of shows like it from the 1950s that were on for years but today are completely forgotten. Had Super Circus been filmed rather than performed live, perhaps it would have remained in syndication for decades. Maybe it would be airing on Me-TV or Antenna TV today. This should be fun since even 2000s decade has obscure and forgotten series. NBC claims this was the first mystery series broadcasted on TV. It starred Gene O’Donnell and Judy Parrish. MR. BLACK – ABC – 30 minute mystery aired Monday 9:30-10pm in 1949. Very little is known about this series but it starred Andy Christopher as Mr. Black. CHICAGOLAND MYSTERY PLAYERS – WGN 1947-50 (also aired on DuMont 1949-50). What makes this series worth finding was its gimmick. The TV show did not reveal the solution to the mystery. Viewers had to buy the next day Chicago Tribune newspaper to learn the solution. The Tribune Co. owned WGN. 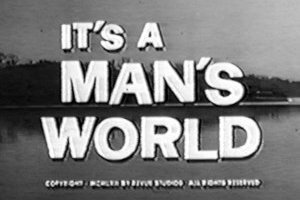 And of course there are one shot TV shows such as: MR. AND MRS. NORTH – NBC -1948 – Starred Don Haggerty in the first play televised in New York. PETER HUNTER, PRIVATE EYE – 1948. Described by TCM database as “earliest known syndicated pilot film.” Starred Frank Albertson. Written by George Ludlam. Directed by Joseph Cotton. I’m surprised that the Smithsonian, the Library of Congress or another organization hasn’t put out the surviving audio of “Hour Glass” or others 40s shows on compact disc. It would make an interesting set and could include a book with photos from the show and background on early television. “The Black Robe” (Saturday, WNBT, 10-10:30) is one of the most original shows we’ve ever seen on television. The action takes place in a police night court. The cases, which may range from robbery to minor offences, are brought before a judge and given a hearing. The “actors” of the show are not real actors but persons picked from all walks of life. By using these people the show manages to take on an air of reality seldom seen on video. The magistrate is kind or harsh depending on the character of the case before the bar. “The Black Robe” manages to present a true picture of, as the judge says “life in a great city after dark”. It is truly one of the best shows on television at this time.